World War II had ended and the remnants of the auto industry were retooling from the manufacture of planes and tanks to providing civilian transportation. Studebaker produced an iconoclastic gem with the 1950-1951 Champion Starlight Coupe. The "bullet nose" front end and wrap around rear window earned a populist tag, "Which way is it going?" With an excess of "aerodynamics" it earned both admiration and ridicule. The "bullet nose" was also used on models like the 4-door sedan which did not include the wrap around window. Bullet Nose Gallery The 1952 Studebakers were liberated from this "out of this world" styling and served as a transition to Robert E. Bourke's classic 1953 Commander Starliner Hardtop. 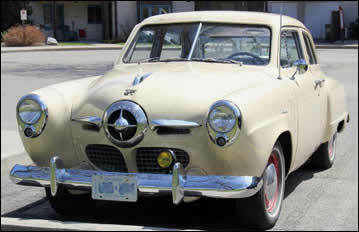 1950 Studebaker Champion 4-Door Sedan. The 1950 Champion Starlight Coupe side view. Photo compliments of Owls Head Transportation Museum. The 1950 Champion Starlight Coupe showing the "bullet nose" front end design. Photo compliments of Owls Head Transportation Museum. The 1950 Champion Starlight Coupe showing the wrap around rear window design. Photo compliments of Owls Head Transportation Museum.